Subtraction Problems for the whole class! It’s almost time for your birthday! 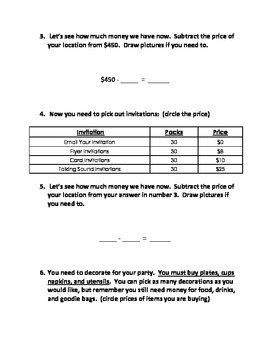 You’re parents decided to let you plan your party this year. 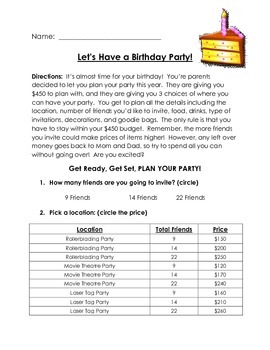 They are giving you $450 to plan with, and they are giving you 3 choices of where you can have your party. 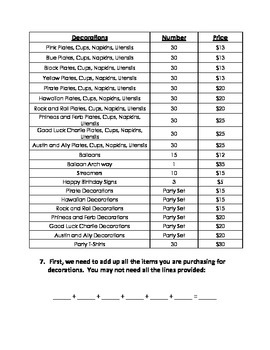 You get to plan all the details including the location, number of friends you’d like to invite, food, drinks, type of invitations, decorations, and goodie bags. The only rule is that you have to stay within your $450 budget. Remember, the more friends you invite could make prices of items higher! 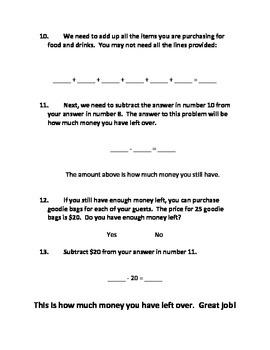 However, any left over money goes back to Mom and Dad, so try to spend all you can without going over! Are you excited?